Sony's W Series Walkman is a bare-bones MP3 player with a key selling point and good marketing ; it's waterproof and sold in a water bottle !. But it can be a difficult thing to highlight on store shelves especially when you are limited to the normal retail packaging. Sony decided to try something different the company brilliant plan to help differentiate its products from other brands like Apple's iPod shuffle. The earbud/MP3 player combo comes packed inside a full bottle of water, a nice marketing tactic that immediately hints it's waterproof features. 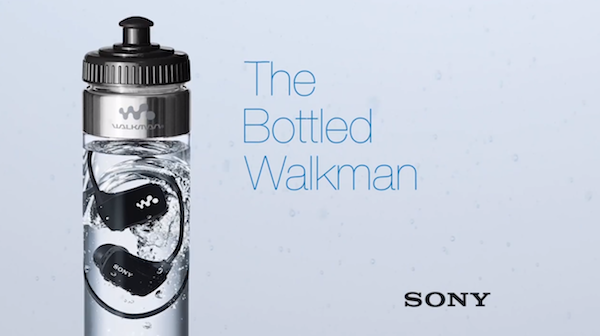 Sony really concentrated on product placement for this "bottled Walkman".